Heat, mold, and use within minutes. Great for all sorts of projects. 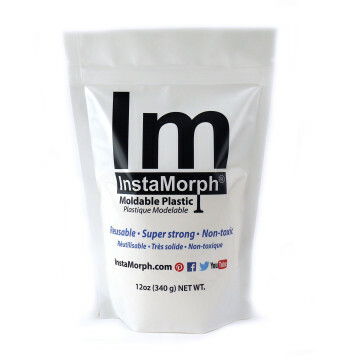 Add a little (or a lot) of color to your next project with an InstaMorph pigment pack. Specially formulated to work with InstaMorph. Click here for videos and instructions. Same great material - exciting new color! InstaMorph is a lightweight thermoplastic which acts like clay when warm, but when it cools, it’s a strong plastic. Everything from masks, costume pieces, brackets, molds, toys, handles, grips, custom cases, stands, prototypes, replacement parts. InstaMorph is ideal for makers, hobbiests, artists, fixers, cosplayers, tinkers, or anyone else that needs a custom part made out of plastic. InstaMorph is available online through various retailers and available in bulk directly from us here at InstaMorph.com. Hey you! Yes, you there. Made something cool with your InstaMorph and don’t mind showing it off the world? If so, you should enter our “Morph of the Month” contest for a chance to win some free InstaMorph each month. There are tons of things you can create, fix, modify or improve using InstaMorph. Here is a sampling of the recent creations from users just like you. Have your own to share? Send us an email with a picture and description. We’d love to feature your idea here some day. InstaMorph is great for all sorts of projects. Create props, masks, and other costume pieces. Integrate InstaMorph into your next maker project. Improve the items you use around the house. See how users made things “fit better” with a little InstaMorph. Don’t throw it away! Fix it with InstaMorph. InstaMorph comes in many different sizes, so there should be one available to fit your project needs. It never hurts to have a little extra InstaMorph on hand though for those impromptu projects and repairs. InstaMorph is like plastic duct tape and deserves a place in your toolbox. They may have already been answered for your in our Frequently Asked Questions section. Things like “how much InstaMorph do I need for my project” and many others are answered there. We have created a special set of posts designed to help you master the material and take your InstaMorph creations to the next level. Learn how to bond InstaMorph to itself, and much more. You can find the InstaMorph team members in all the most popular social media sites across the web. Come say hi, ask a question, and post pictures of your latest InstaMorph projects for the community to see.